My fresh peach recipes are delightful. 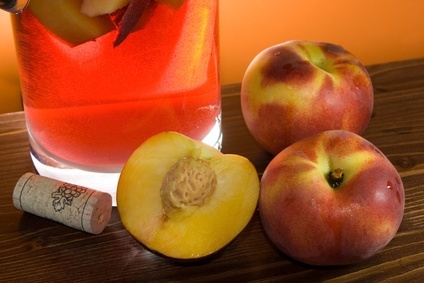 I include recipes for a refreshing peach margarita and homemade peach schnapps. 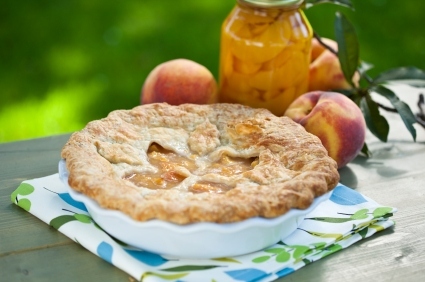 Offering the best peach desserts from fresh peach cobbler and easy peach pie recipe to peach jam and homemade peach bread. When you are shopping, look for peaches with skins that show a background color of yellow or warm cream. The amount of pink or red blush on their cheeks depends on the variety and is not a reliable indicator of ripeness. Undertones of green indicate the peaches were picked too early and will not ripen properly, and won't be sweet. Look for plump, medium to large peaches with unwrinkled skins. Choose peaches that are mildly fragrant. Avoid rock-hard peaches and choose those the yield slightly to pressure along the seam, even if they may otherwise be fairly firm. Peaches at this stage of ripeness will soften if kept at room temperature for a few days before you make any peach recipe. Tan circles or spots on the skin are early signs of decay. Store them in a single layer with their stem down to prevent bruising. When you sniff the stem end, a ripe peach will smell very sweet and peachy. Use them immediately (in my fresh peach recipes) or refrigerate them. 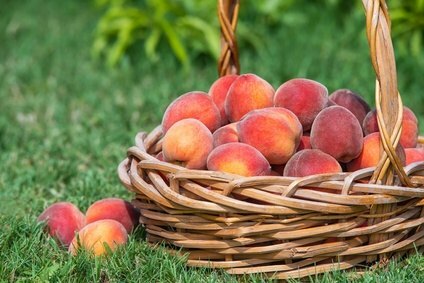 Peaches should be washed thoroughly and can be rubbed with a paper towel to remove the fuzz on the skin. Whole peaches can be peeled easily by immersing a few peaches at a time in boiling water for about 15 seconds, and then plunging them into ice water. The skin will rip right off. You may freeze peaches by cleaning them up, drying them off and peeling them. See above for the peeling part. Pit them and slice them in quarters and place in a freezer bag...That's it; and you can make these fresh peach recipes with your stash of peaches any time of the year. Just a quick suggestion: freestone or or cling-free peaches are a easy route to go for freezing, because the pit comes out easily. So enjoy the following fresh peach recipes. In most cases, nectarines may be substituted for peaches in equal measure. Mix the flour, salt and baking powder together. Cut in the shortening with a pastry blender. Add the ice cold water a little at a time, using just enough to bind the mixture so the dough can be patted to form a ball. Handle this as little as possible. Form two thirds of the dough into a round disk and place on a lightly flour board. Save the remaining dough for the top crust. Roll the dough from the center outward with a light even pressure to form a circle about 1/8" thick and an inch larger than the pie plate. Fold in half and lift gently into pie plate. Unfold and fit loosely in place; do not stretch the dough. Trim edges leaving 1/4 to 1/2" extra all the way around. Heap with the peach filling. Roll out the top crust and fold in half and place over pie filling. Cut slits in it to allow steam to escape. Brush the edges of the bottom crust with water, and fit the top crust over the filling and lightly press top edges together. Trim edges evenly and flute. Stir together the flour, 1 cup of white sugar and cinnamon; set aside. Wash, peel and slice the fresh peaches and add to the flour mixture. Place mixture in the pie plate over the crust. Seal with the top crust. (See above directions) Sprinkle the top with the 2 TBS sugar. Cover the crust edges with foil and remove the foil during the last 15 minutes of baking. Bake 35-45 minutes or until crust is brown, and juice begins to bubble through the slits in the crust. This pie may be frozen for future use. The following fresh peach recipe is OUT OF THIS WORLD. It is very impressive and easy to make; with a crunchy topping. Place the peaches in the pie crust. In a bowl, mix 1 cup sugar, 1/3 cup flour and salt. Next, add the eggs and sour cream. Beat well and spoon this mixture over the peaches. In another bowl, combine 1/2 cup sugar, 1/2 cup flour and 1/4 cup of butter until this mixture resembles coarse meal. Sprinkle this topping over the pie. Bake for 60 minutes, or until the pie is golden brown. Garnish with fresh peaches and serve with whipped cream. Refrigerate leftovers. Melt the butter and place in a 9x13 pan. Mix together the flour, sugars, baking powder and salt. Stir in the milk and egg and combine with the dry ingredients. Pour batter evenly over the melted butter. Combine the peaches, sugars and spices - spread over the batter. DO NOT STIR. Bake for 35-45 minutes or until the batter comes to the top, and is golden brown. 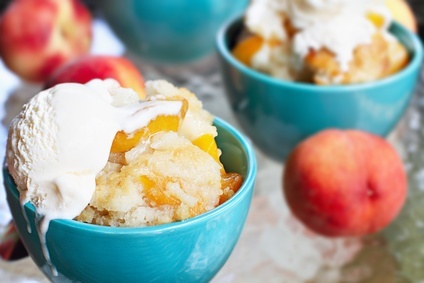 Serve this warm fresh peach cobbler with my homemade vanilla ice cream. Don't forget to check out another one of my fresh peach recipes below for bread. In a large glass pitcher, combine wine, peach vodka, lemon concentrate and sugar. Stir until the sugar is dissolved. Add the peaches and grapes. Refrigerate a minimum of two hours; it's better overnight. PREHEAT oven to 350 degrees. Grease a casserole dish and set aside. Blanch peaches in boiling water for 30 seconds and place immediately in cold water. Peel and slice them; place in a large bowl. Add 1/8 cup (half of 1/4 cup) and 1/4 cup of brown sugar and the tablespoon of flour. Toss to mix and let sit for a few minutes. If there still is a lot of liquid, just add more flour a teaspoon at a time. Meanwhile, add 3/4 cup flour, 1/2 cup oats and butter and mix together in a small bowl with your fingers until crumbly. Pour peaches in the prepared dish and sprinkle oat mixture on top. Bake 45 minutes to 1 hour, until the top is browned and crisp and the juices are bubbly. Serve immediately, or store in the refrigerator. To reheat cobbler, bake in a 350 degree oven for 20 to 25 minutes. Wash, peel, pit and chop the peaches -- you need 10 cups. Place all of the ingredients in a large glass bowl and let sit for one hour. Transfer to a large pot and bring to a full boil. Boil for approximately 25 minutes to reach the jell-point; stirring and as it reaches jell-point - stir continuously. Remove from the heat and skim off the foam. Ladle into clean, hot jars leaving 1/4" head space. Process in a boiling water bath for ten minutes. Just like that...and you have a little piece of summer on a slice of toast. 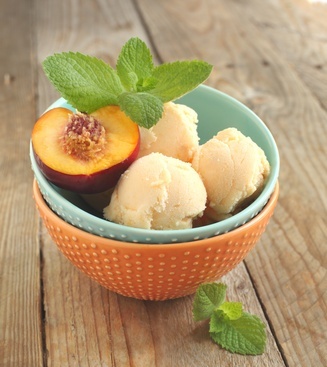 This fresh peach recipe is just dreamy on a hot day. In a blender, puree the peaches. (Peeling them is optional) Blend in the remaining ingredients and process until really smooth. Chill the mixture until cold, or 1-2 hours. Pour the mixture into your ice cream maker and follow the manufacturer's instructions. It may be necessary to continue the "chill/beat" cycle for 15-30 minutes after the first cycle stops. Add the chopped peaches about 5 minutes before it is done. NOTE: Since fresh peach ice cream is very soft, it maybe necessary to let it "ripen" in your ice cream maker for an additional 45 minutes (or place in a bowl in freezer) if you prefer a firmer ice cream. Heat water and sugar until dissolved. Let cool. Add Everclear liquor and peach flavoring. Pour into bottles or jars. Let sit in a refrigerator for one week before drinking. You may want to freeze heavy mugs so the drink is as frosty as in the photo - for this fresh peach recipe. Fill the blender 3/4 full of ice. Add all of the ingredients except the sliced peaches. Blend and serve with a sliced peach. You may use a peach to wet the rim of the glass and dunk the glass in white sugar before adding the margarita. I love this fresh peach recipe (and so does everyone else). Place peach and kiwi slices in a glass bowl. Add citrus juices and sugar to taste. Stir GENTLY to blend. Top with whipped cream. Nothing like this fresh peach recipe to start the day. Put each piece in the baking dish, and then bake in the oven for 10 minutes or until egg mixture has turned golden brown. Divide the toast between two plates. Spoon the yogurt over the toast and top with peach slices and sprinkle with toasted almonds. Your friends and family will love this fresh peach recipe. TOASTING ALMONDS - spread the almonds over a cookie sheet and cook stirring once for 5 - 6 minutes in an oven on 375 degrees. Keep this page bookmarked for more fresh peach recipes. Enjoy.